I had trouble picking my Book of the Week this week for various reasons, and I’m sorry that this post is a bit short. 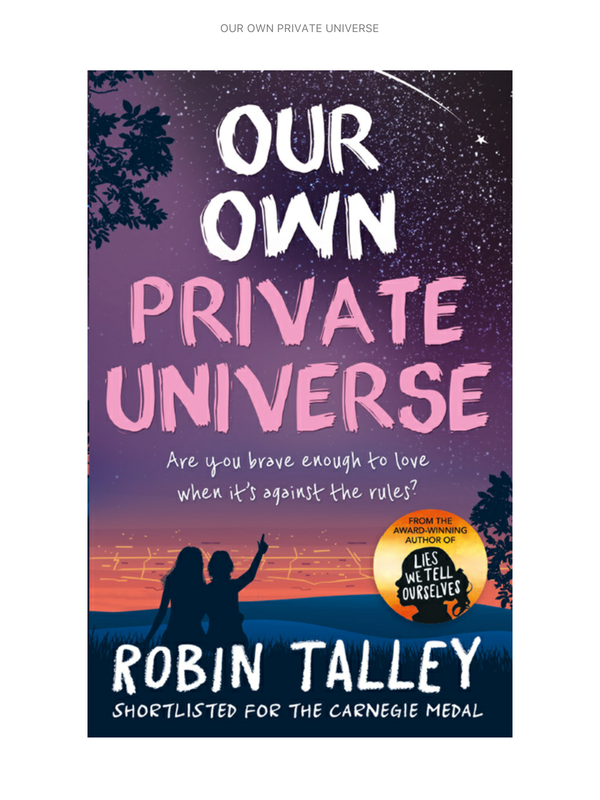 Anyway, this week’s BotW is Our Own Private Universe by Robin Talley. I read this last week, and while bits of it didn’t work for me (of which more below) it’s a story that I haven’t read before (maybe I haven’t been looking in the right places!) and that needs to be represented more in fiction – particularly YA fiction. 15-year-old Aki is bi-sexual, but so far she’s only told her best friend Lori. She’s off to Mexico for the summer with her church youth group and the pair have a plan to start getting out there and living an interesting life. At the camp, Aki meets Christa and the two have a connection. But it’s not easy trying to navigate your first relationship with everyone watching you – especially if you’re trying to keep it quiet. And how do you know if it’s love anyway? There was a lot about this that I liked. It’s a diverse (in every way) queer coming of age story that (spoiler alert) doesn’t end in deaths and disownment. But that’s not to say there isn’t plenty of angst, because there is. In fact that was my main gripe with the book – that at times Aki just went too far over my whining teenager limit and there was a lot of petty drama that I could have done without. But I have a low tolerance for that sort of thing – so it may work much better for the target market of angsty teenagers than it does for me! But although it’s not perfect, stories like this need to be told and need to be out there. And the world needs more happy YA love stories (or at least I do! )- whether they’re F/F, M/M or M/F. My copy came from NetGalley, but Our Our Private Universe is available in paperback from Amazon, Waterstones and Foyles and on Kindle and Kobo.